The Onni Group secured a $125 million construction loan for the second phase of its massive Old Town Park rental complex. Wells Fargo is providing financing for the 428-unit tower that Onni is building at 202 West Hill Street in Old Town, according to property records. Now under construction, it will feature a six-story podium with a parking garage and ground-floor retail space. The 39-story building joins a 32-story, 405-unit tower Onni erected at 1140 North Wells Street. The two towers will be part of a three-building complex on the grounds of the former Atrium Village apartment complex, according to Curbed. The third tower will also be 39 stories. A spokesperson for Vancouver-based Onnie did not immediately return a call seeking comment. In addition to the three towers, Onni will rehab one of the 1970s-era Atrium buildings at the northwest corner of the property, Curbed reported. Not far from the Old Town Park complex, Onni is planning a 41-story, 356-unit residential tower at 353 West Grand Avenue in River North. 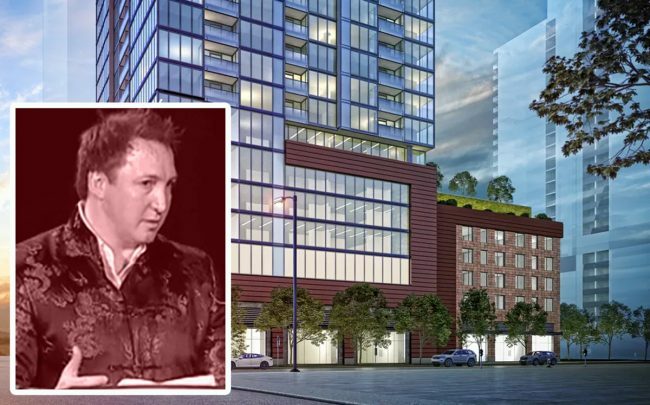 But the developer backed out of another rental project in September, nixing a deal with Greyhound to build an apartment complex on the bus company’s eight-acre Goose Island facility. The deal had been lined up for nearly a year, but fizzled in part because of the tighter affordability requirements the city imposed on new development in some areas late last year. Onni earlier this year paid $17.5 million to acquire a property at 352 North Union Avenue from Cardiff Mason Development, three months after the city approved plans for a 373-unit apartment building to rise on the site.